Before the seed is sown, fork in some fine compost into the soil at a rate of a bucketful to the sq. yd. After this apply carbonate of lime at 4 oz. (120g) to the sq. yd. unless the ground is already chalky. Sow the seed about the middle March, to ensue a succession, make a second sowing two weeks later. Of course you don't have to grow the seedlings yourself, most garden centres sell sections of sprout cabbage ready for planting. It will be the end of May or early June before the plants are ready to be re-planted into their final position. They can be planted in rows 2 ft. (60cm) apart and allow 1 Â½ ft. (45cm) between the plants. If you want very early cabbages that are well hearted in June, sow the seed of a variety such as Primo early in February a cold frame in rows 6 in. (15cm) apart. When the plants come through, they must be given some ventilation on warm days. Increase the ventilation in March or early April so that they harden off ready to be planted into their permanent position. Allow 1 Â½ ft (45cm) between rows and 1 ft. (30cm) between plants. 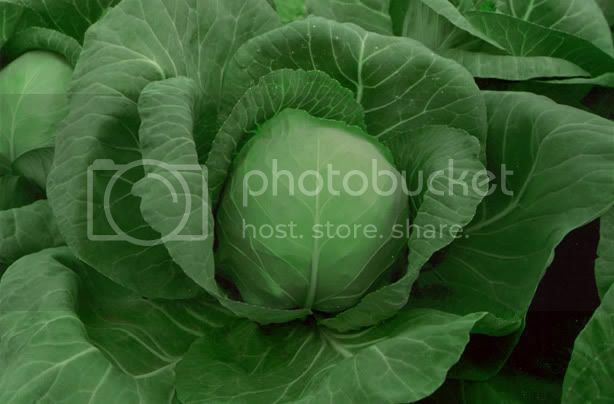 Photo / pic / image of Summer & Autumn Cabbage. Keep down the weeds; watch out for pests such as greenfly, whitefly, and caterpillars. A good way to protect the crop is to add a barrier of fine netting or fleece to keep the flying insects off the plants. The cabbages can be cut as soon as they have good hearts. Pull up stumps, put them on the compost heap. The seed is sown as for summer and autumn cabbages; in the north it may be necessary to sow it in the middle of March, but in areas where the weather is mild it can be sown in April or May. To save time the seeds can be sown where they are to grow. Sow three seeds every 2 ft. (60cm) along a drill; later the plants can be thinned out to allow room for good growth and development. Those that were not sown in their final growing position can be planted out in July allowing 2 ft. (60cm) between the plants. Winter cabbage will be ready for cutting any time between November and the end of February depending of course on the variety sown. It will be a long time before the hearts burst and run to seed once the cold weather has arrived. Can you tell me how to get rid of caterpillars is there an easier way than picking them off by hand. Posted: Mon Aug 13, 2007 11:11 pm Post subject: Caterpillars, an easier way than picking them off by hand. If it is in relation to cabbages or other veg try the following, all will be effective if timed correctly. The most safest and organic method to use is to start checking your plants or vegetables earlier for the butterflies eggs which will become the eventual larvae which you are now having problems with. Removing them at the egg stage will prevent them from eating the leaves of your plants. Another safe and organic cure is to mix 1 tablespoon of salt into 2 litres of water which you can spray onto the caterpillars. This may kill some of them and stun the others which will then fall from the plants. They will then be ready to be swept up with dustpan and brush or eaten by the birds. Or you could spray with a garden centre bought spray called "liquid derris", as it can be used on crops right up to one day before harvest. why do my cabbage leaves go purple with purple dots on the bottom leaves? they arent very big either, i only have the two. Posted: Mon Aug 20, 2007 11:25 pm Post subject: Purple blotch (Alternaria porri ) or Alternaria leaf spot. It sounds like Purple blotch (Alternaria porri ) or Alternaria leaf spot. An unfortunate big downside of our so-called (wet) summer, as frequent dews rain showers favour this disease development. The bottom leaves of the cabbage are usually infected first with purple or brown circular spots on the leaves. Infected leaves often turn yellow after this before dropping. It may cause your crop to fail or it may not, but it will still be edible if it survives. To prevent it occurring next season you should remove all fallen cabbage leaves immediately, then burn them or bin them instead of composting them. Avoid crowding your cabbage plants, as good air circulation is one of the things that the disease dislikes. Remove any weeds around the cabbages plants to increase air circulation, plus a weed free cabbage patch will be much stronger and able to battle diseases. In autumn and winter rake and destroy all fallen leaves and cabbage stumps. Don't forget to practice crop rotation, sowing next year's cabbage in a totally new part of the veg garden.